Antrim hurlers' promotion hopes suffered a blow as they were beaten 2-11 to 0-10 by Westmeath in the top-of-the-table game in Division Two A.
Robbie Greville's immediate goal helped Westmeath led 1-5 to 0-2 before Antrim cut the margin to 1-6 to 0-5 by the break at Mullingar. 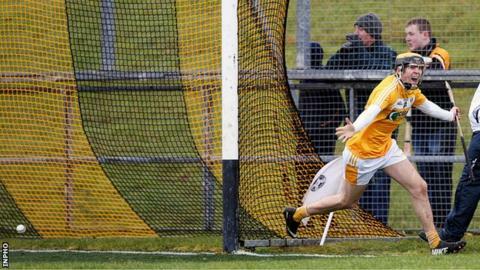 Antrim were three behind with seven minutes left but Derek McNicholas' goal sealed Westmeath's win. McNicholas finished with an impressive tally of 1-6 for Michael Ryan's side. Despite the defeat, Antrim will be fancied to regroup to earn a Division 2A final meeting against Westmeath. Westmeath lead the table on six points while Carlow's 2-25 to 0-9 win over Derry moves them alongside the Saffrons on four points. London are in fourth spot on three points after the draw with Kildare on Saturday while Derry are propping up the table after their third straight defeat. Down were knocked off the top of Division Two B after they suffered a 0-20 to 0-16 defeat by new leaders Mayo at Pairc Esler. Armagh joined Down on four points as they edged a 2-17 to 2-15 win over Wicklow.